LC:To understand the importance of sun safety. It is really important that you protect your eyes against the sun because the sun emits UV rays which can damage your eyes and skin .My sun hat can protect your eyes from the sun by blocking out the worst rays and providing shade for your eyes and face. 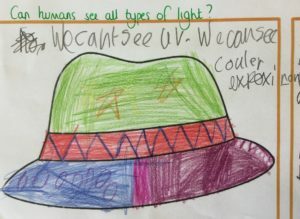 Hello my name is Evie and at my school my class have been learning about how fast light can travel. If you dont know how fast it goes, then I am going to tell you the answer. Light travels so fast you can’t even see it go and I know that because we watched a good video. Light is a good thing because it helps us to see in the dark.You can not see in the dark because there is no light. You can’t see in the dark that’s why we have lights so we can see in the dark. Then we don’t trip in the dark.